This research by Harvard obviously doesn’t apply to you, because you’re the exception in life. You’re superhuman. For the rest of us, the study is a convincing reminder of mortality. Not only convincing, but alarming. The recent trend of making movies into trilogies — or better yet, four part trilogies where the third movie is bifurcated into two even more drawn out movies — is really the best thing to happen to cinema since at least technicolor, at most sound. In fact, I think audiences have really missed out on a lot of epic, multi-part stories. I mean, mini series were big in the ’80s, for crying out loud! Couldn’t Hollywood see the writing on the wall? Skate to the puck a little sooner? 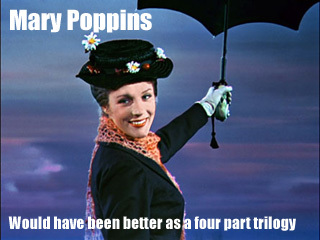 Even better, they should have started making trilogies a half a century earlier. Can’t you just imagine the possibilities? No?